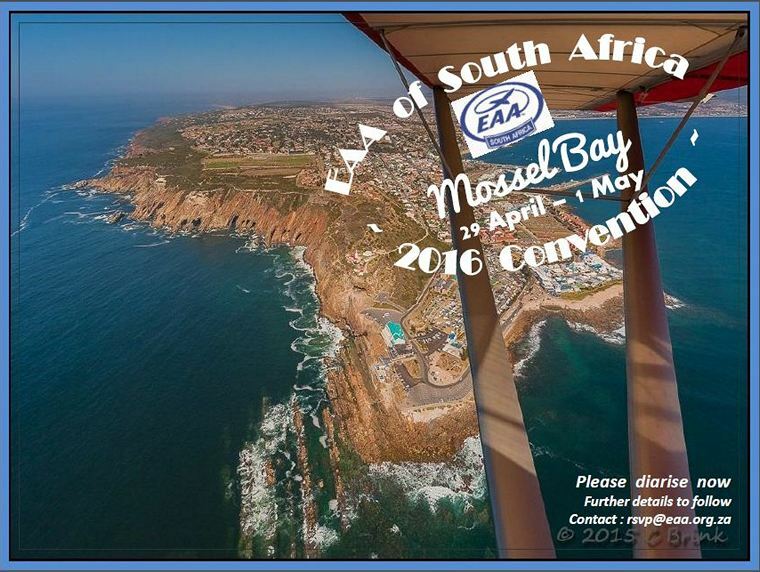 11: EAA Aviation Legends Talk Show. Guest, Charlie Marais finished with the SA Air Force in 2001 as a Lt. Colonel. During his 30 year military career he completed 36 months in the Angolan Bush War as a Helicopter Gunship Pilot, he served as Office Commanding of (both) 87 Flying School and 16 Squadron (the Rooivalk Attack Helicopter Squadron). Amongst many other achievements he lead the 16 ship Harvard Formation Aerobatic Team 21 times; he flew the Rooivalk Attack Helicopter as Display Pilot in 65 Airshows and 2 Military Demonstrations overseas. 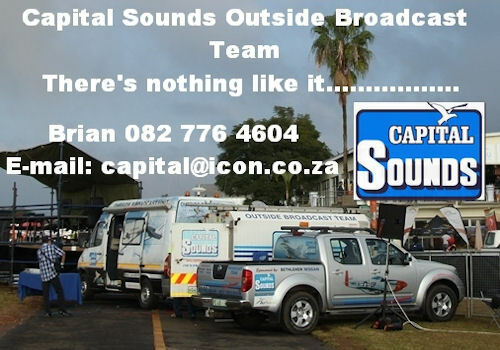 20-21: Armed Forces week Port Elizabeth Beachfront. Combined Air Force, Navy and Army event, the biggest ever open to the public. 12: Coves Breakfast Fly-in Country Estate Hartbeespoort. 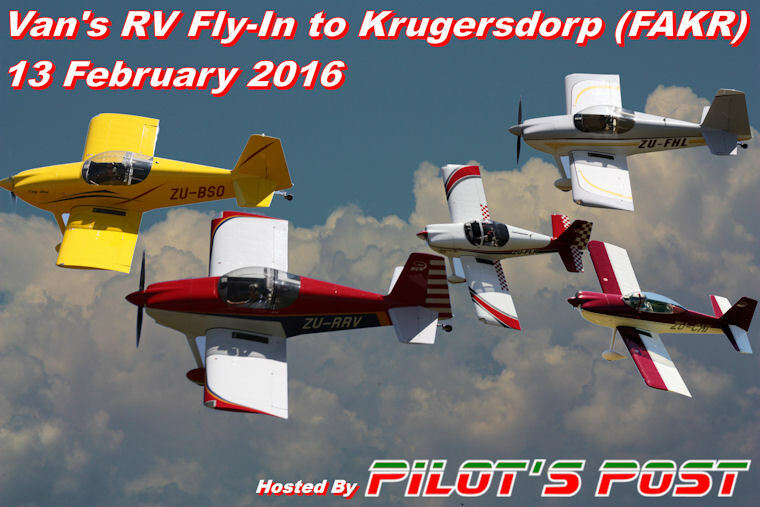 13: Rosslyn Aero Modellers Fly-Inn. 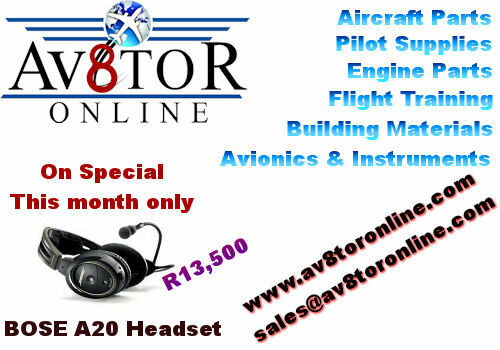 Landing fee of a R100.00 will be payable on arrival by the pilots. Hot-dogs and cool drinks will be available. No flying without a valid SAMAA card. 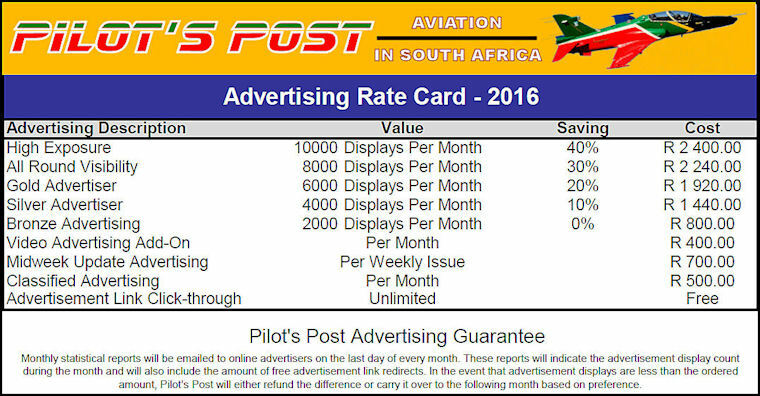 Contact Ina Van Der Merwe at fullstop@mweb.co.za for any inquiries. 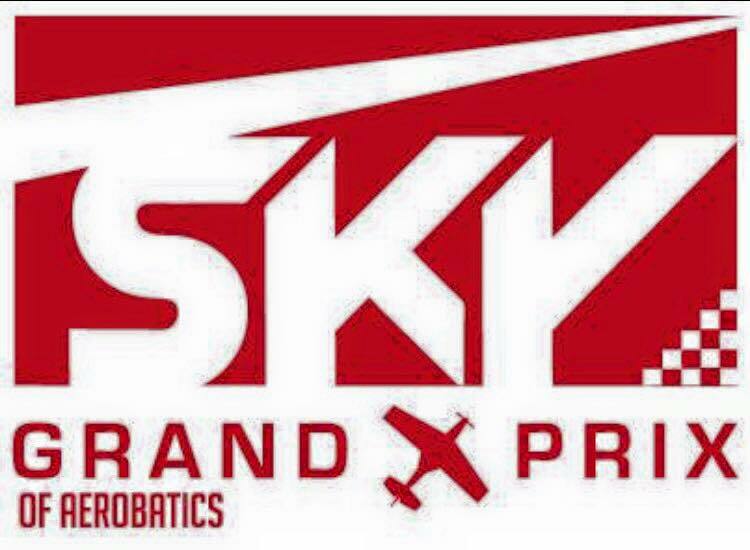 28: Sky Grand Prix. Details to follow. Safair's long awaited coffee table book is now available from the Aviation Shop. At R400.00 the 160 page hardbound full colour history of one of South Africa's most iconic aviation companies is a real bargain. Established in 1965 when parent company Safmarine purchased Tropair (Pty) Ltd Safair purchased its first Hercules L-382 in 1970 and in 1977 with a fleet of sixteen became the biggest civil operator of the type in the world. "After fifty years it's still just for the love of flying" covers not only the full operational history of the legendary C-130 but also all the types that throughout the years formed part of the company's fleet. 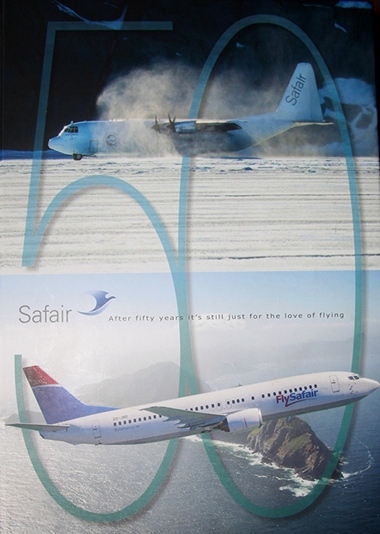 The first eighty eight pages consist of seven chapters that trace the company's history in its various areas of operations that include Humanitarian Aid and Relieve, Engineering and Maintenance, Oil Spill Response, Safair and Conservation, Operations in Antarctica and an introduction into FlySafair. Pages ninety four to one hundred and fifty seven cover the history of the eighteen types operated by the company. The C-130 alone is covered in fourteen pages and features a brief history and photo of each of the twenty four of Lockheed's iconic medium lifter that had served as part of the Safair's fleet. Other types featured in a similar fashion are the Convair 580, Boeing 707-300, BAe 146-100T & 200QC, Paternavia AP68-TP600, Boeing 727-200 & 737-200 & 400, MD-81 & 82 & 83 & 87 and Casa CN235-10. Well written, easy to read and lavishly illustrated 'Safair 50, after fifty years it's still just for the love of flying' is a must have for aviation historians or anyone interested in the history of civil aviation in South Africa. Embraer announced today that Jackie Chan, a world-renowned movie star, has become the first customer in China to take delivery of a Legacy 500. "The Legacy 500 features our best-to-date technologies and it incorporates designs that maximize passenger comfort and fuel efficiency," said Marco Tulio Pellegrini, President & CEO, Embraer Executive Jets. "This new aircraft, along with the Legacy 650 that we already delivered to Mr. Chan, will further facilitate his business development, as well as his humanitarian activities." Jackie Chan's connection with Embraer Executive Jets dates to 2012, when he received an Embraer Legacy 650 as China's launch customer and became Embraer's brand ambassador. Guan Dongyuan, Senior Vice President of Embraer and President of Embraer China, said: "We feel privileged to deliver the Legacy 500 to Jackie Chan, who is not only a world-renowned star, business elite and philanthropist, but also Embraer's old partner, loyal customer and brand ambassador. 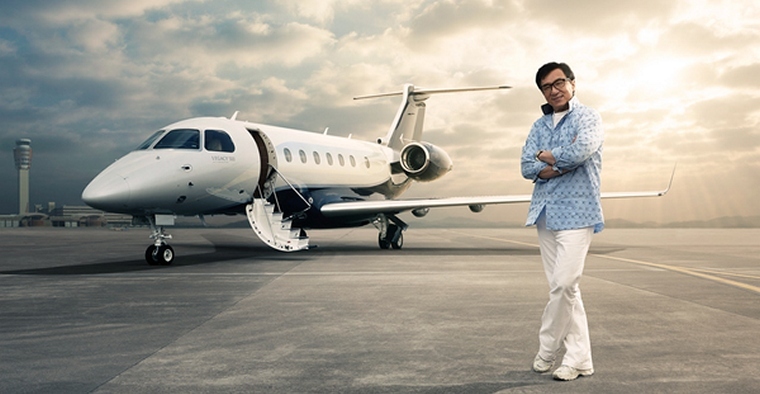 I believe Jackie Chan's choice reflects the changing mind-set among Chinese customers that midsize executive jets can fulfil most of their business missions with higher efficiency and greater flexibility." 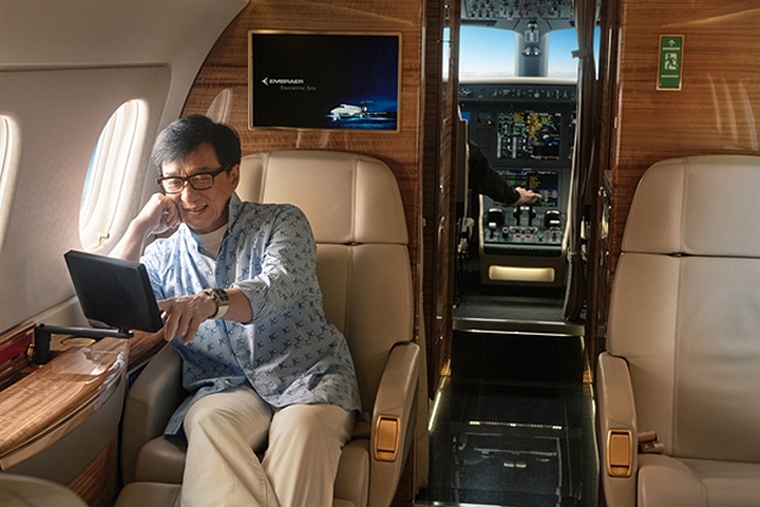 "I'm so thrilled to receive this Legacy 500, a state-of-art executive jet," said Jackie Chan. "In the past few years my Legacy 650 has brought me fantastic traveling experiences and great convenience, allowing me to do more acting and philanthropic works around the world. I'm sure that the performance of the new Legacy 500 will again exceed my expectations, and become a comfortable mobile home and office for me." The Legacy 500 was granted Validation of Type Certificate from the Civil Aviation Administration of China (CAAC) in July 2015. 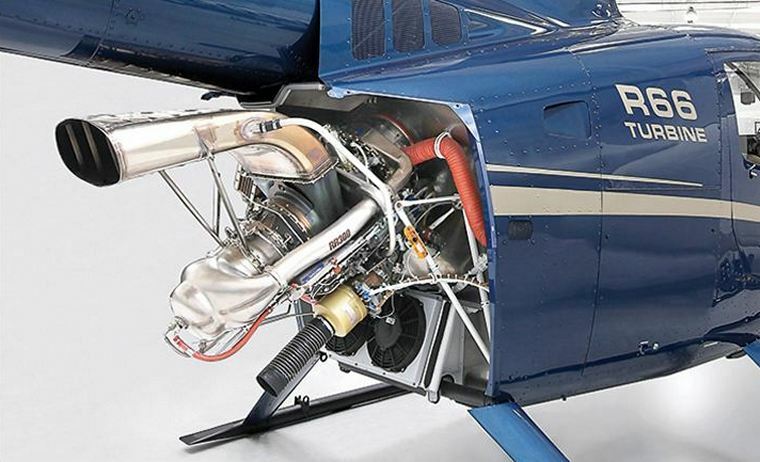 Robinson's 700th R66 Turbine rolled off the production line on December 18, 2015, five years after the 5-place helicopter was FAA certificated. Serial Number 700 is an R66 Turbine Marine, which is an R66 equipped with pop-out floats, and will be delivered to Robinson Dealer Air Technology Belgium. This will be the first Turbine Marine delivered to Europe since EASA approved the float option in October and one of the more than fifty R66s sold to Europe. Robinson recently added the Garmin G500H Flight Display, and the Genesys HeliSAS Autopilot to the R66 options list. Currently in development are an R66 auxiliary fuel tank and an R66 cargo hook. Both options are projected for release in 2016. To date, Robinson has approved 120 R66 Service Centers worldwide, of which seventy two are Dealers. Founded in 1973, Robinson Helicopter Company is the world's leading manufacturer of civil helicopters. Tecnam announced that it had been selected to provide an Integrated Training System (ITS), including three Tecnam P2006T Twins to the Italian Air Force (ITA AF). The Italian Air Force's decision follows an extensive two year procurement evaluation programme and consists of Tecnam providing not only three P2006T Twin aircraft but also a flight simulator, training for pilots and technicians and maintenance/assistance for a contract period of 3 years and 3.600 hours in total. At the ITA AF request Tecnam will be incorporating small design changes to ensure the aircraft are fit for the tough requirements of military service. The three P2006T's will fly with military identification marks, once the validation from EASA CS-23 to AER/Italian Air Force certification has been achieved. The Tecnam P2006T was certified under EASA CS-23, IFR category in 2009 and in a further 16 countries to date. It is available in a wide range of models including the P2006T SMP (Special Mission Platform) variant, which provides a flexible, safe and low cost surveillance platform with multiple sensor capability. NASA recently selected the Tecnam P2006T to evaluate 'distributed power technology' confirming the platform as one of the best design developed by Tecnam's award winning President and Head of Design, Professor Luigi Pascale. 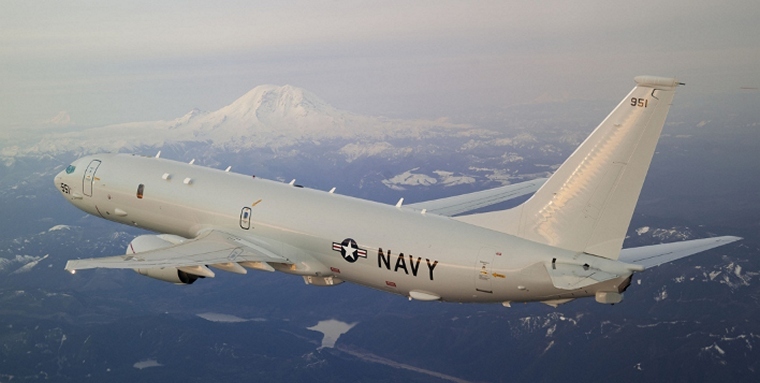 Boeing [NYSE: BA] will further equip the U.S. Navy and Royal Australian Air Force (RAAF) with maritime patrol capabilities, building 20 more P-8A Poseidon aircraft following a $2.5 billion U.S. Navy order announced yesterday. The contract, for Lot 7 of the total P-8A program of record, includes 16 aircraft for the U.S. Navy and the next four aircraft for the RAAF. The RAAF's initial four P-8A aircraft were included in the August 2015 Lot 6 contract award. "We continue to hear feedback from our Navy customer about the incredible capabilities of the P-8A," said James Dodd, Boeing vice president and program manager of P-8 Programs. "The deployed squadrons tell us it's exceeding expectations - we're looking forward to providing even more capability to the fleet and to Australia." This latest award puts Boeing on contract to build 78 Poseidons for the Navy and eight for the Australian fleet, with 33 Poseidons delivered to the U.S. Navy to date. The Lot 7 aircraft will begin delivery in late 2017. Based on Boeing's Next-Generation 737-800 commercial airplane, the P-8A offers the worlds' most advanced anti-submarine, anti-surface warfare and intelligence, surveillance and reconnaissance capabilities. The Navy has deployed four P-8A patrol squadrons since operations began in 2013. Australia's participation in the P-8A program began in 2009 when the government signed the first in a series of memorandums of understanding to work with the U.S. Navy on system design and development. The U.S. Navy and the RAAF also established a joint program office that operates at Naval Air Station Patuxent River, Md. The first Australian P-8A will be delivered to the RAAF in late 2016. Boeing [NYSE:BA] and Saudia, Saudi Arabia's national airline, today celebrated the triple delivery of two Boeing 787-9 Dreamliners and a 777-300ER (Extended Range). A third Dreamliner will be delivered to Saudia within the next week. The airline ordered eight 787-9s in 2010. Saudia is no stranger to such large deliveries. In December 1999, Boeing delivered three 777s to Saudia. "The delivery of our first Dreamliners marks yet another exciting chapter in Saudia's long-standing relationship with Boeing that began in the early 1960s," said His Excellency Eng. Saleh bin Nasser al-Jasser, Director-General, Saudi Arabian Airlines. "With its reputation for reliability, operational efficiency and comfort, we now look forward to the 787 becoming an integral addition to Saudia's fleet as we continue our fleet modernization and expansion as part of our transformation plans." The airline will now have 48 Boeing airplanes in its fleet that currently include 777-200ERs, 777-300ERs and 747-400s. Over the last 55 years, Saudia has taken delivery of over 130 Boeing airplanes including 707s, 737s, MD-11Fs, DC-9s and MD90s. "This delivery to Saudia is an outstanding moment in a partnership that has grown phenomenally over the last several decades," said Boeing Commercial Airplanes President and CEO Ray Conner. "Today, we are proud not only to have Saudia join our growing base of 787 customers in the Middle East, but also at the airline's continued confidence in Boeing's technology and airplanes over the years." The Boeing 787 Dreamliner is an all-new, super-efficient family of commercial airplanes that brings big-jet ranges and speed to the middle of the market. In response to airlines' overwhelming preference, Boeing designed the 787 family with superior efficiency, which allows airlines to profitably open new routes to fly people directly where they'd like to go in exceptional comfort. Since entering service in 2011, the 787 family is flying more than 350 routes and has established more than 75 new nonstop routes around the world. More than 60 customers - including Saudia - from around the world have placed orders for more than 1,000 airplanes, making the 787 Dreamliner the fastest selling twin-aisle airplane in Boeing history. 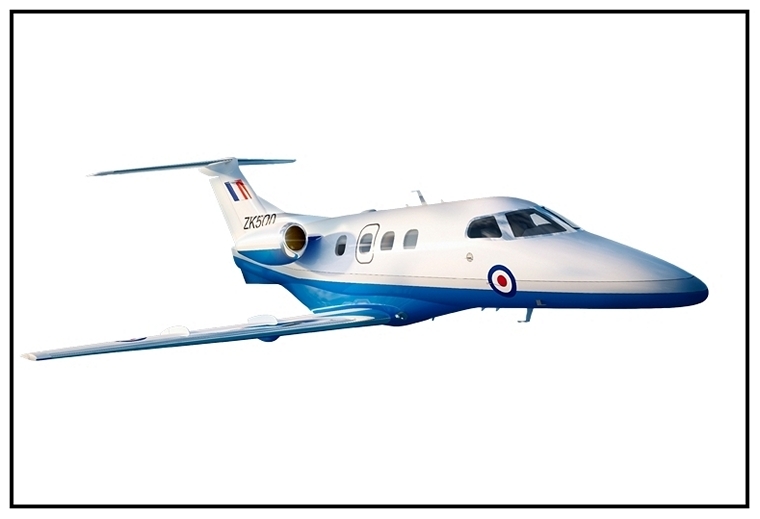 The Embraer Phenom 100 business jet was selected to provide multi-engine pilot training to armed forces aircrew in the United Kingdom. The contract with Affinity Flight Training Services will provide five aircraft to the U.K Ministry of Defence's Military Flying Training System, (UKMFTS) program. The contract includes support services and an option for additional follow on aircraft. The Fixed Wing programme is intended to replace the elementary, multi-engine and basic flying training that is currently delivered on aging platforms with a new fully integrated solution that provides state-of-the-art training aircraft, ground based training devices and courseware all derived from the training design developed by Ascent Flight Training, the training service provider of the MFTS programme in UK. In 2014, Affinity was selected by Ascent Flight Training to provide and operate the aircraft selected for the MFTS programme. "We are very proud to be selected in such an important programme for United Kingdom´s Ministry of Defence", said Jackson Schneider, President and CEO of Embraer Defence & Security. "The Phenom 100 is a very reliable, cost-effective and easy to operate aircraft that was also selected to provide flight training services to major international airlines". The UKMFTS takes United Kingdom armed forces aircrew from initial training through, elementary, basic and advanced flying training phases preparing them for their arrival at their designated operational conversion units. The system is operated by Ascent Flight Training, a consortium formed by Lockheed Martin and Babcock International under a Private Finance Initiative contract for the UK's Ministry of Defence. Russian Helicopters, part of State Corporation Rostec, delivered the final batch of helicopters to India under a previously signed agreement. India received 151 Mi-17V-5 military transport helicopters produced by JSC Kazan Helicopters through Rosoboronexport. "India is one of the key markets for Russian helicopter building industry and the largest operator of Russian-made helicopters in the South-East Asia. Today, this country uses more than 400 helicopters, which have proved themselves well," said Russian Helicopter CEO Alexander Mikheev. "We produce high-tech multirole helicopters capable of solving the most difficult tasks anywhere in the world." 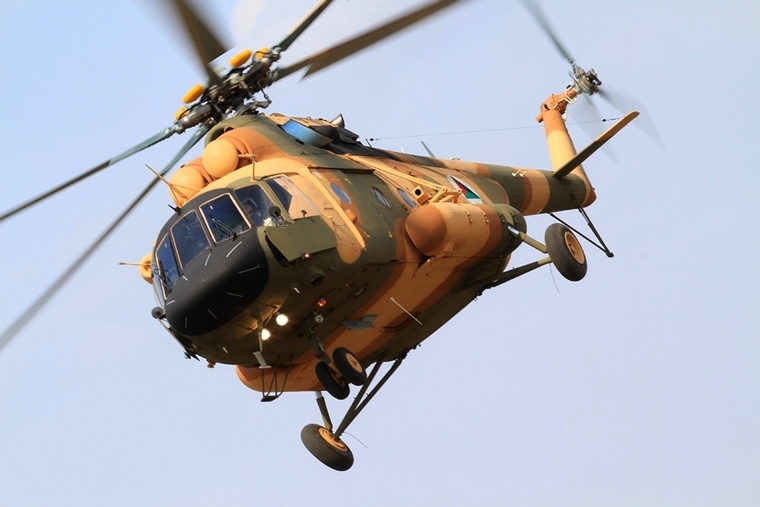 The Mi-17V-5 helicopters supplied to India are some of the best technically equipped helicopters of the Mi-8/17 series and gathered the best solutions of previous generations. Every Indian Mi-17V-5 helicopter is fitted with a KNEI-8 avionics suite. The suite has replaced multiple systems indicators with four large multi-functional that is easy to read and reduce the intensity of pilot's workload. This avionics suite also helps to cut down pre-flight inspection time by displaying all systems data and alerting the crew when necessary. Besides, the helicopters supplied to India are equipped with the latest and more powerful engines, which will greatly enhance its payload carriage capability at higher altitudes, characteristic of the Indian landscape. Somalia, Mogadishu: A Somalian Airbus A320 has made an emergency landing at the country's Mogadishu International Airport after an explosion tore a hole in its fuselage minutes after take-off. Officials say two people were injured in the incident but none killed - although there have been unconfirmed reports that one person fell out of the hole in the plane. The cause of the explosion is not yet known, but aviation experts and the plane's pilot have suggested it was a bomb. The pilot, 64-year-old Vladimir Vodopivec said, "I think it was a bomb. Luckily, the flight controls were not damaged so I could return and land at the airport. Something like this has never happened in my flight career." The jet's 74 passengers and crew were safely evacuated after landing. According to news reports authorities recovered the body of a man about 20 miles from Mogadishu. Investigators think the man used a wheelchair to conceal a bomb. USA, Wisconsin: Witnesses reported seeing the undercarriage of a light aircraft that was making an approach to nearby Sylvania Airport clipping the roof of a moving semi-truck. A motorist on the freeway struck a piece of the landing gear. The 65-year-old pilot accompanied by his wife landed the plane in the grass at the end of the runway. UK, Kent: A Man was arrested after he shone a laser at pilots above Kent. Reports that the nuisance light was distracting several commercial flights were called into police who searched for the man. Several passenger flights travelling over the Isle of Sheppey were affected by the distracting laser before the man was arrested by Kent Police. USA, Florida: The left two main tyres blew on a McDonnell Douglas MD-80 jet landing at LVIA. Two tires blew out on the Allegiant Air jet as the plane landed at Lehigh Valley International Airport. None of the 158 people on board was injured. USA, Dallas: A P-51C Mustang of the Commemorative Air Force Red Tail Squadron honouring the Tuskegee Airmen landed with its gears up at a Dallas airport during an event commemorating Black History Month. There were no reports of a fire resulting from the landing, and no one was injured. The aircraft sustained substantial damage. February 10 1929 - Evelyn "Bobbi" Trout broke the record for the first all-night flight by a woman as well as and the new women's solo endurance record flying more than 17 hours in an open cockpit Bruner Winkle biplane .Trout flew from Mines Field USA. February 10 1923 - An experimental night flight arrives to Le Bourget, France, from Croydon, England. The pilot has given his position by radio and used the aviation light beacons to make his approach. February 11 2006 - Steve Fossett set the absolute world record for "distance without landing" by flying his GlobalFlyer from the Kennedy Space Centre, Florida, around the world eastbound, then upon returning to Florida continuing across the Atlantic a second time to land in Bournemouth, England. The official distance was 25,766 statute miles (41,467 km) and the duration was 76 hours 45 min. February 11 2000 - Jacqueline Auriol, French aviatrix, dies (b. 1917). Auriol earned a military pilot license 1950 then qualified as one of the first female test pilots. She was among the first women to break the sound barrier and set five world speed records. Her exploits earned her the Harmon Trophy 1951 and aga1952. February 12 1969 - The Mil Mi12, the world's largest helicopter, establishes a number of load-to-height records. February 12 1928 - Lady Mary Hearth leaves Cape Town in an Avro Avian in an attempt to make the first solo flight by a woman from South Africa to England. She will arrive in Croydon on May 17. February 12 1903 - The world's first successful heavier-than-air aircraft engine, which will power the Wright brothers' first airplane in December 1903, runs for the first time in Dayton, Ohio. February 13 1923 - Chuck Yeager, American fighter & test pilot, and the first person to break the "sound barrier" in level flight, is born (1947). February 14 1989 - The first of 24 Global Positioning System (Block-II) satellites is placed into orbit. February 14 1896 - Birth of Mary Anita 'Neta' Snook Southern, American pioneer aviator who achieved a long list of firsts, first woman aviator in Iowa, first woman student accepted at the Curtiss Flying School in Virginia, first woman "aviatrix" to run her own aviation business and first woman to run a commercial airfield. She was Amelia Earhart's first flying instructor. February 16 2009 - An entire South African Airways crew is arrested at London Heathrow Airport after five kilos of cocaine are allegedly discovered in a bag. It is the second drug arrest of an entire SAA crew for drug smuggling within three weeks. February 16 1912 - Frank Coffyn takes aerial views of New York City with a cinema camera while controlling his airplane with his feet and knees.